Reading a Sarah Dessen book is the essence of YA contemporary. She manages to capture all of its glory in such a flawless, unforgiving manner. The characters are multi dimensional, coming alive from the pages with their unique voices. Dessen is known for her strong-willed character driven novels, and thats a familiarity that I have come to love within her story-telling. 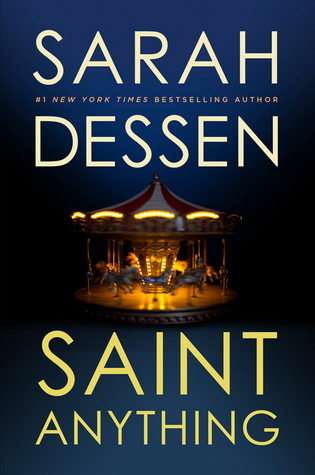 Saint Anything holds its own, yet still offers the comfort of a true Dessen novel. Immediately I am drawn to Sydney and the shadows she lives in as always being second best to her spotlight brother Peyton. But when tragedy strikes, sending Peyton to jail, it forces Sydney to step up, creating her own platform to perch from. I was cautious of Sydney, wanting to see her step out on her own, but also wanting to create a safe harbor for her, too. She's always done the right thing her entire life, so when she decides to be bold and venture into new friendships that lead to new adventures, I found myself cheering her along. I had difficulty reading some of the interactions between Sydney and her mother. Not because it was bad form on Dessen's part, but because it felt so authentic. As the adult reader, I knew Sydney's mom ultimately loved her and only wanted to protect her. But I could also see the damage it was doing to Sydney's reluctant courage. When I find myself shouting out at the pages while reading, I know I'm encountering some amazing writing. Overall I was pleased with Dessen's latest. Her beautiful writing reminded me why I fell in love with her storytelling in the first place. She's an author I wish I would have had as a teenager. I know its directness, yet gentleness would have spoke volumes to my teenage heart. I can only imagine the positive impact this particular story will have on today's youth and the ones to come. So looking forward to reading her new book - I LOVE her! I'm so, so excited to read Saint Anything! It's been ages since I last read a Sarah Dessen novel, and I can't wait to revisit her brand of storytelling in this latest release. So glad to hear that you enjoyed this one! LOVE Dessen. And love how she portrays familial relationships in her books, even if they're not blood-related. I'm 4 books away from having read all of her works. All of them have hit me right in the feels. I'm so jealous I would trade in my college degree for a copy of this book. I love Sarah Dessen and I love how emotionally raw she can be in some of her stories. I've been reading her books for years and she has never failed. I can't wait to read this. Great Review, now I really, really looking forward to this! I always think of you when I see this book - I was hoping you'd enjoy it, since I know you're a fan of Dessen's! I like the sound of all the relationships in the book. Lovely review, hon!